International Transportation Innovation Center CTO Dr. Joachim Taiber recently shared the stage with executives from Porsche Cars North America and Siemens at the German Mittelstand — Southern SME Forum in Savannah, Georgia. 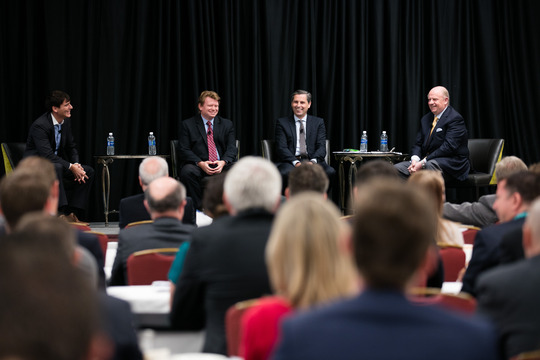 Held April 18, Taiber and fellow panelists engaged in an energetic and enlightening discussion about The Future of Mobility before a packed house inside Savannah’s Hyatt Regency Hotel. The 90-minute presentation centered on how transportation technology — particularly vehicle electrification, vehicle automation and digital services — is altering current industry structures, business models, value creation and more. The German Mittelstand — Southern SME Forum is an annual conference of the German American Chambers of Commerce (GACC). The event provides a platform for German and American companies to exchange ideas while building relationships, and offers the opportunity to gain insights on innovative business practices. Based in New York City, the GACC fosters the economic ties between Germany and America.